The Producer: Hi Erin! If you were to define your role as a sports choreographer to someone who doesn’t know what you do, how would you describe it? EC: That’s kind of tough. The key thing is authenticity, so I’m an authenticator - is that a word? [Laughs] The key thing is going into a shoot and being able to make sure that it’s efficient, proficient and authentic. Nike, one of my top clients, stands for authenticity, so my job is to ensure everything is authentic from every movement within the sport, but also within the athlete, the individual. Meaning that Kyrie Irving is totally different than Lebron. Lebron is totally different than Kevin Durant. And KD’s totally different than Kobe. I know each person’s mannerisms, their techniques, the areas that they work on. That’s my job. I make sure they do the exact same things on set. So when it comes to sports choreography for advertising and we’re shooting multiple athletes, then I create a scenario that’s authentic within the sport but then also in regards to each individual athlete. TP: Erin, How did you get started doing sports choreography? 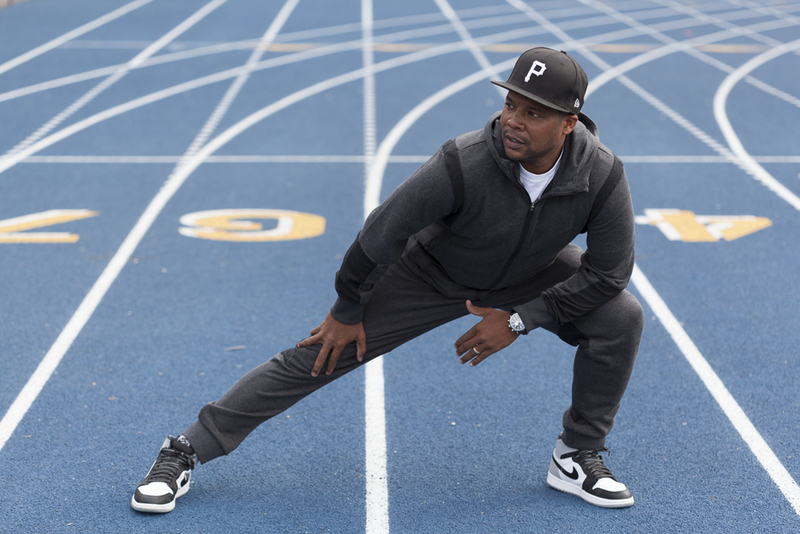 Erin Cowan: The global creative director for Nike Basketball, Ray Butts! I met him and he said, “Hey I have an opportunity for you to do some stuff with me,” and I said, “Well, what do you want me to do?” He said, “We’re looking to shoot multiple athletes in a photo shoot. I heard you’re pretty knowledgeable about basketball and pretty experienced,” so we scheduled a test shoot and I worked with one of his art directors. I oversaw a combinations of drills, exercises and activities for all the athletes and I gave the creative team my perspective on how to shoot it from different angles. That test shoot turned out great, which was awesome because it led to my first shoot, which was Tony Parker and Manu Ginobili. I knew Tony Parker already, but it was my first time meeting Manu, and basically I was the coach of the court. I said, “I want you to do these certain moves” — the inside-out dribble, the split, pick and roll. I want you to do an up-&-under or shoot a reverse layup — so I knew all the terminology, all the lingo, which made it easier for the art director and the creative team to get those images. I would just go in there and give them four or five things that I thought would look good on camera. They already had their shot list, but I made their shot list come to life. After that, it was a domino effect. My next shoots were with Jason Kidd, Richard Jefferson and Vince Carter. TP: How long ago was that? EC: Hard to believe, but that was already 10 years ago. What I had worked on was a global campaign and I’d been working with the team that went to the NBA finals. I knew Jason Kidd & Richard Jefferson from previous basketball experiences and Vince Carter as well because Vince was in Toronto and that’s where my best friends had gotten drafted. TP: So back to how you got started. How did this individual at Nike find you? What were you doing at the time? EC: I was a sports agent at the time here in Portland and I had started my own small agency. I represented one NBA player, a couple of overseas players and I trained many of the elite athletes. So I had been very involved with all the basketball concepts, I was really knowledgeable about the game and I mentor at my former high school. At this high school, we had the most Division One basketball players in minor league in the state and I was involved with a majority of those athletes. Training them gave me the opportunity to be able to say, “Hey, I worked with all of these guys, some are professional athletes. One of my clients was a professional athlete, they played for the Portland Trailblazers, and I had that rapport with the athletes”. It was seamless. It was very easy just to come in basically from being a coach and then working with the same athletes, because I know what to tell them and I know what to do to make it work and be efficient. TP: So you had experience representing but also training top-level athletes. Would you say that the training has helped inform you when you work with younger athletes too? For example, you seem to have a knowledge of what the body is capable of executing. When you and I have gone over shot lists you’ve said, “These young athletes can do this exercise for 10 or 20 minutes - it’s not sustainable after that” or “This athlete can do these drills but only for x amount of time”. Would you say that the training you did for those past athletes helps you now in your sports choreography? EC: Oh yeah, absolutely - I mean shooting young athletes all the way to professional athletes - I run a lot of camps, a lot of clinics, so I understand their attention span. I know certain techniques that they can do at this particular age. If a kid is 10 years old, there are certain technical things that they can do and certain technical things that they simply can’t do yet. They’re still developing their motor skills. Some kids can talk, walk, and chew bubble gum [at the same time], some kids can’t. Some clients have the expectation for kids to perform as if they’re professional athletes - well hey, they’re kids first and foremost so they’re going to be a little goofy. We can be somewhat technical, but a lot of kids don’t know how to run properly. This is where I come in and say, “I’m going to teach you how to run. Keep your elbows in, keep your hands out”. Depending if we’re doing speed or distance running, there are certain looks that you have to have, so with the younger kids it is seamless. Now with the pros, it’s just knowing what they’re going to do and what they won’t. If you show an athlete a picture of a drill or idea, they might say, “I don’t do that.” So what you’ve got to do is create that scenario for them and say, “Hey, Lebron, remember when you played against Detroit Pistons and you went off and you scored 20-something straight points in the game? Now What was that feeling like?” I gave him context, made him feel comfortable, so then I was like, “Remember that move you did?” “Oh yeah, nobody could forget that move, what’d you do?” Then he’ll recite what I asked him in the move that he would do - and then I would say, “Well do that right now!” So it becomes seamless. You’ve just got to be able to talk their lingo. And that goes for all athletes. TP: Absolutely. I seem to remember that you also have experience as an MC, right? EC: [Laughs] Yeah. The key thing there was the relationship with the athletes and the connection to the people that I work with. TP: Yeah you really do, Erin! You’re always smiling, happy and positive. EC: That takes you a long way! The MC thing was really something! The client said, “We’re going to give you some talking points, these points of reference that we want you talk about throughout the whole day. Your personality is great, so we’re going to have you mic up, and you’re going to walk around talking about NikePlus.” I was like, “All right!” I worked on the whole campaign, knew all the ins & outs of the campaign, so I knew what to talk about. All I did was be myself with a microphone and the jokes rolled out. That’s just who I am and everybody seemed to love it. They asked me to come back and do it again, so I’ve been an MC on certain occasions for certain projects — the World Basketball Association for their global campaign and for their young athletes - so that’s where you had Lebron and Kevin Durant and those guys. They had all the younger kids come in and on the other side we had shoppers coming in to try on shoes. It ended up being a really cool consumer experience. TP: How do you fit into a production? Are you more often hired directly by Nike or by a production company? In the instances that we’ve worked together, you were hired by our production company. Actually, I might need to back up and recap your role a bit. Regardless of whether you are hired by a client, photographer, director or production company, each creative individual has a certain vision of what they need. You’re the one who comes in and says, “This concept or movement is authentic, this is what can actually take place,” and you help shape what’s truly achievable within the realm of authentic movement. EC: With production it’s just more of trying to be that liaison. A lot of times a photographer or creative director may not know the intricacies of a particular sport. They might be a fan, and have a certain concept, but their concern is more about how to achieve the look that they want — that image. From a production standpoint, I just go in and say, “Hey you know what? Just put me in charge of this particular thing you want to accomplish.” I go in and execute. I focus on four or five activities or movements. I would have the props set up where the professional athletes or talent are able to run through drills and basically just be that liaison between them and the client or creatives. The photographer, let them do what they do well - take pictures! I’ll create and set up all these scenarios to basically to make it look good and in turn the art director & photographer are going to make the client or product look good. My job is to make sure they are authentic images. Really, it’s just a matter of being a liaison and filling that gap between the creative person, the photographer & the talent. TP: In many ways, you are also taking on the role of an AD [assistant director]. Before the shoot takes place, you are very involved in the prep, the pre-production, talking to the creative director saying yes we can do these drills, we can group them like this. You’re also talking to production saying this is the amount of time we can do this for. Then when we actually get to the shoot day, you’re there on the ground as the individual interacting with the talent. You’re their first point of contact for the most part and that’s where I feel your MC experience comes in to play and also your skill with having trained athletes. You are able to talk to anybody, but you also have this wonderful knowledge about what the body can actually do & it’s really great to watch you work. EC: Thank you! It’s crazy, one of the last commercials I worked on was with Kevin Durant for a spot called “The Basketball Never Stops”, with Lance Acord. We created different scenarios to make the athlete feel at home, a really special environment. I recall telling Kevin Durant and J. Cole, “Ok this is what we’re going to do. J. Cole imagine if you were in Rutgers Park, you’re going to be super amped, super excited.” I had to really create a story for him and say, “You’re going to do this.” Even though they had their storyboards, even if it’s for a commercial, sometimes you just throw that away. Hey, just do you! To make a long story short, I remember the VP of Sports Marketing saying, “Erin, we need a megaphone.” I say, “Nah, I just want to talk to the athletes, so I don’t really need that.” That’s big time, you know. And he says, “No, you need that.” So I’m telling Lance, you know, “That’s not real, that’s not authentic, the players wouldn’t do this and the crowd wouldn’t be doing that.” So he says, “Well do it.” So I ran over there and with all the background guys, created a scenario and told all the talent that they are gonna act like this [instead]. Then to all the players on the court, “You guys are going to act like you’re in a game, don’t look at the camera.” So at the end Lance goes, “Give this guy a megaphone!” At this point, I’m doing everything from calling “action” to just directing that whole part. He said, "You just do that part and I’ll film it." So I did that and I’ll never forget that after we shot the commercial he comes up to me and says, “Hey man, you’re really good. You really know sports, the scenes, the background. You know what to look for to make the stories authentic. Are you part of the Guild?” And I’m like, “No, I’m part of SAG but I’m not part of the Director’s Guild.” He asked if I would want to be part of the Director’s Guild. And I’m like, “Well what’s the benefit, I’m doing this already” He’s like, “No, because you’d be a good director of sport commercials. You get a good DP, then you know how to create the scenarios, you know how to motivate the talent, either actor or athlete or extra whatever it is - you have a good eye.” That kind of gave me the ultimate compliment. I didn’t know who Lance Acord was, I hadn’t exactly done my research - sorry about that Lance! [laughs], but you know. TP: It was delayed pleasure after learning what a big deal he is! EC: Yeah, and same thing with Robert Rodriguez. I got an opportunity to work with him on the Kobe commercial and it was the same thing. He said, “Hey, I don’t know about basketball but here, you just set this up. You do you and you’ll call action and you just work with Kobe and the talent and tell them what to do”. That was awesome. TP: Sounds like you’re getting your chops as a director! So are you now part of the DGA? EC: No, not yet but I have directed a few projects, including some of the videos for Nike Basketball. All the signature moves, the training drills. So instead of doing the sports choreography and just showing up on set, I do a lot of behind-the-scenes and creative work as well. It’s kind of like a hybrid. I’m like a little agency. I supply talent, I hire talent, I do casting. TP: And that’s all through your company Jump Sports Management? EC: Yeah, so what I would do with this particular type of project is write a treatment, script out all the action, and they would hire a DP/Cameraman and that’s it — and then I would direct. I would direct all the talent so when Lebron comes on set and says, “What am I doing?” I say, “Okay Lebron, we have these three moves, that’s what you’re going to do. I’ve already got the additional talent all going and we’ve got three plays.” I would go through those three plays, look at the monitor, my DP/Cameraman would film everything and I’ll make sure that it’s all tight. I’ve also been doing some Instagram videos for another client. They were looking for more of a comedy director, a person like Neal Brennan (he pushed comedian Dave Chapelle) - I had just had the opportunity to work with him recently - so they were looking for someone like him but with basketball experience too. So I ended up working with 5 of their athletes and directed their Instagram videos. Business has been picking up with a wide range of project - I’ve been really fortunate. I’ve also been very fortunate to work on the All Star Weekend, where I’m involved in designing all the drills on the basketball court, all the training drills. TP: Alright Erin, what are the three tools of the trade that you need to do your job? EC: First and foremost, the ability to communicate. Then you have to be a fan and be passionate about sports. That’s the second thing. The third thing is, you have to be knowledgeable on how you deliver techniques to make sure everything is authentic. That’s it really, I mean for me at least. I think that a lot of people, they may know the sport better than me - if we’re doing football, soccer or track and field. But when it comes to me, my ability to communicate, research execute and my passion for how I deliver the message, that’s what the athletes want to hear. Because if you’re not passionate about what you’re talking about, they’re going to think you’re just a regular person. I’m not a regular person [laughs]. TP: You certainly are not, you’re special! EC: I don’t want to be [regular]. I’m knowledgeable about every sport because I’m a sports fanatic and I will do my homework if I’m not. For a linebacker or an offensive lineman - I would do my homework and find the best offensive lineman and figure out what they do, what they like, what they don’t like and how they train. I would study that before the shoot and I would execute. TP: Are there any tool you need when you’re actually on set besides your voice? EC: No. I don’t need anything, to be honest. Just my voice, my eyes and my presence. No seriously, there’s no tools really. Well, I feed off people. So the energy has to be there or I have to create the energy. TP: You create the energy, you do! You’ve got that sparkle. Do you work alone at your company, or a staff? How does Jump Sports Management work? EC: I contract out a lot of different people so I have a lot of relationships around the country. TP: So you have a stable of sports choreographer individuals who have certain sports specialties? EC: Yeah so in football, basketball, track - I just reach out to my contacts. One of the things I’ve learned in this business is that you’ve got to be resourceful. I’ll find people who have a good personality, are very knowledgeable about the sport, can execute, and are professional or business-oriented. So I just call them up and contract them out and say, “Hey I got a job, this is the client, this is what they want to achieve.” I am still involved in writing the treatment, so they can understand the vision and execute it. Also sometimes production companies don’t have a budget to fly me out, so they say, “Erin, who do you have in New York or Chicago?” I then act as an agent and contract other people out. So I have people on the East & West coast, the Midwest, primarily those locations where I know there are a lot of shoots - so New York, Chicago, Los Angeles, DC. I contract a lot of people out. Here in Portland, I have five people that I work with and I have a guy in LA, another company that I associate with, so with him, we just partner up if they’re looking for talent because he knows all the SAG rules if we’re doing broadcast, & I’m not an expert in that. TP: That’s a wonderful complement to your business and it also shows that you’re community-minded. It’s not simply an industry - you’re reaching out and you are sharing the business. We do that in production as well. It’s good karma. EC: You’ve got to be resourceful. Being resourceful like that and finding the right people gives you credibility. I consider myself a small boutique agency. I don’t have a big conglomerate or a major business, but I work on large-scale major projects. Being able to network and find the right people who can execute if I’m unavailable. The key thing is trying to find more me [TP: Ha!]. It’s hard to find people like yourself just because of the energy and the things I bring to the table, but it’s fun training a younger person. I have a couple of interns as well. I train them on visualizing camera angles & being production savvy. I pick them first for their particular sport - from there I teach them camera angles, how to talk to the athlete, or if you’re working with talent, how to coach the talent, how to work professionally in that environment. To me, it’s like a secret society. I’m not a big fan of social media for my own business, even though I love it personally. I like to look at it, but all the work projects are confidential so I can’t really go out and post pictures and I don’t fraternize either with the talent or the athletes. It’s good to be behind the scenes. And I love that and that’s part of why I get hired a lot. TP: How do you promote yourself? EC: I have a website, but the final images, which you know, are so tough to get. Sometimes you have to wait more than 6 months. To me, I think the best promotion for myself is knowing the right people. A lot of my work comes through word of mouth. I hate to say it because it’s kind of cliche, but it is just someone saying, “Call Erin, because he can get the job done.” I think that’s the best way because I could promote myself via billboards or ads or sending out mail or media and press kits to different people, but I simply know the right people. The clients end up saying, “If we’re doing XYZ, we want this person on set,” so that’s how it goes. TP: It’s great to hear that you take interns too because I know that you pride yourself on the mentoring work you do with local kids here in the community and with your friends you’ve introduced me to. What do you look for when you take on an intern? EC: First and foremost is passion. They have to be very passionate about the sport. And responsible. They have to have that creative side, to be an innovator and to be able to communicate. Again, communication is paramount. I had an intern and his very first shoot was a multimillion dollar shoot, with 18 professional athletes. This is a kid I trained and worked with and I mentored him and now he works in sports marketing for Nike Basketball. And it was me saying this is what we do, this is how we do it, I have this opportunity, and I can pay you to do some things and you’ll probably do a little travel, that’s it. Then just teaching them how clients like Nike work, that’s the key too - they’re a matrix - knowing how their system operates, knowing what they look for. TP: We’ve talked about Nike a lot, but you work for other companies as well, right? EC: Yeah I’ve done some special projects where I was more of a director for Adidas, in different capacities., I don’t have exclusivity with any company, however Nike’s been the bread-winner. I’ve done some stuff with Under Armor more as an MC or a moderator, which turned out very well. Being a journalist, doing interviews - I’m asked to come in and moderate, ask questions, create content. TP: Once again, because you do the research you find out who you’re interviewing and you have that uncanny ability to talk to anybody! Thank you, Erin, for sharing your story! Check out Erin's work here. And find out what Erin looks for in an intern! Interview with Erin Cowan by Annika Howe, photos by Adrian Alston.